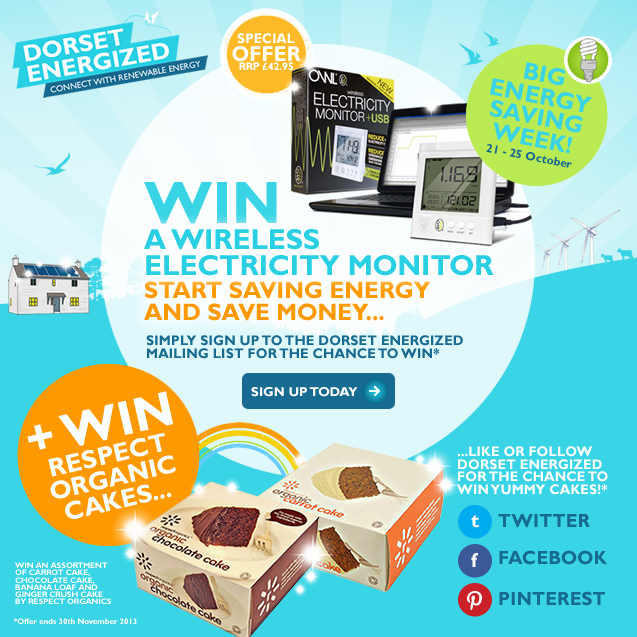 To celebrate the start of BIG ENERGY SAVING WEEK (21st – 25th October 2013), Dorset Energized have launched a very special offer to win an OWL Wireless Electricity Monitor courtesy of our partners Good Energy. Plus, as a double whammy, if you like us on Twitter, Facebook or Pinterest you’ll also have the chance to win an assortment of yummy cakes by our friends at Respect Organics, and if you share our offer on your social networks you’ll have even more chances to win cakes! The OWL+USB Wireless Electricity Monitor (which retails at £42.95) is a complete wireless electricity monitoring solution to let you monitor your electricity usage through live and historical charts via your PC at a time to suit you, via the supplied USB cable and software supplied. With a superior memory capability, ultra fast download speed, Owl + USB makes it easy for you to track and save money. It’s ideal for anyone who wants to be able to see a visible reduction in their consumption and cost of electricity or reduce their household impact on the environment to fight against climate change. All Respect Organics cakes are organic and use free-range eggs. Organic farming releases less greenhouse gases than non-organic farming, so choosing organic, local and seasonal food can significantly reduce your carbon footprint. Whilst using and generating renewable energy is really important, we also need to be more energy efficient to reduce our energy consumption. There are lots of small steps you can take to save energy in your home and save money too! Plus… look out for more energy saving tips later this week here on our blog, and check out our section all about Energy Efficiency.